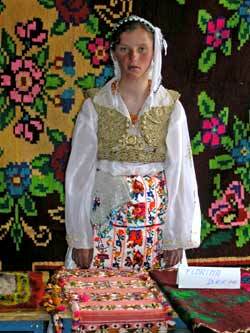 Schoolchildren in rural northern Albania keep traditions of song and dance alive. 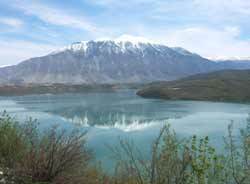 Springtime in northern Albania. The town of Kukes, nominated for the Nobel Peace Prize in 2000 in recognition of its role in hosting 400,000 Kosovar refugees in 1999, can be seen in the distance. 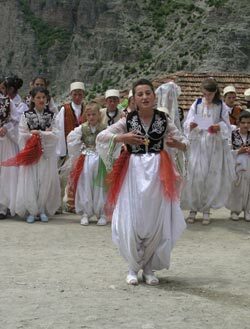 Transrural and its Albanian partner organisation, the Rural Associations Support Programme (RASP) have long been active in northern Albania working to improve rural livelihoods in the area between Puka and Kukes. Primary agriculture alone struggles to meet these needs. Transrural, RASP and Puka Town Council therefore formed a partnership to explore the potential of generating income through tourism. This eco-tourism initiative shares common ground with the "Homestay" initiative in Romania ( but differs in being a locally-based co-ordinated action involving the town council, nearby village communes, schools, farmers' groups and hotel owners, as well as residents who feel they have something to offer visitors and would like to participate. A Tourism Action Committee was established and a Tourism Action Plan commissioned, drawing on experience in other rural areas of Albania and with the help of a Peace Corps volunteer stationed in Puka. Although eastern Europe as a whole is a newly emerging tourist destination, Albania 's share of overnight visitors is tiny (0.03%). Puka itself has not been well served by tourist guides, who mention it as a "pass-through" point. This reflects the amount of work that is required to develop tourism. More positively, there is increased potential for diaspora tourism and for attracting Albanian city visitors; and a newly refurbished hotel. The committee analysed the area's assets: good water and clean air, forests and wildlife, a healthy mountain climate, medicinal plants, religious and music festivals, two museums, places of archaeological and historical interest, and the opportunity for both summer and winter sports, including skiing and trekking. Local people were invited to submit their ideas of what could, and should, be done, and whether it could be achieved locally, or needed government lobbying or outside investment. 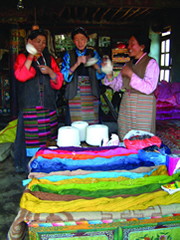 Among the ideas submitted are lobbying local and national government for investment in more secure energy supplies and better roads; cleaning the waterways and exploiting the attraction of lakes and rivers; upgrading the skiing areas; running a "Citizen Awareness Campaign" on tourism alongside professional courses on hospitality; training local guides; putting up signage; and giving tour operators a taste of the area. Work has only just started on making these ideas happen. With progress, it could become an example of what a community can achieve when it comes together to agree a common purpose and then sets about making it happen.